I have been making a lot of bias tape lately because I am using it to finish my seams. When I need a large amount of bias tape, I always use this method. 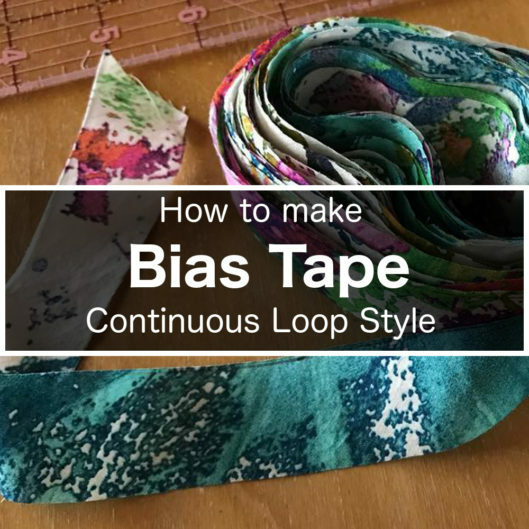 For a lack of better term, I call this the “continuous loop method” of making bias tape. By stitching only two seams, you are able to make a really long bias tape. Cut a square piece of fabric. Draw a line from the bottom left corner to the top right corner. Cut along the line. Now you have two triangles. With right sides together, put the triangles together matching the top edge. However, there’s a nuance here. Do you see that there are little triangles hanging out? That is because I am offsetting for the seam allowance. I am using 1/4″ (6 mm) here. Press the seam open and you have this. Whip out your pen again. Draw lines parallel to the *longer” edge. My bias tape will be 1″ (2.5 cm) wide, so I am drawing the lines 1″ (2.5 cm) apart. The likelihood is that the last section will not have the width you need, so trim it off and discard. With right sides together, line up the short edges like this, so the lines you drew are connected/straight. But this is not what we want actually. We need to “pull” the corners so that the one line is connected to the neighboring line instead. By doing so, you see that there are overhangs on each side. With right sides together again, you can pin the edges together. Similarly, to prepare for the 1/4″ (6 mm) seam allowance, the lines need to off set a little bit. You can faintly see through this fabric; do you see that the lines are crisscrossed? Stitch the seam and press, and this is what you have. You can now cut from one end, following the line (which is now continuous). And you will end up with one long bias tape! There are some pros and cons with this method. With relatively little fabric, you can produce a long bias tape. It only needs two seams to make a long bias tape. After you cut, you will realize that there are lot of seams within a pretty short length. This is the price you pay I suppose. Hope this helps! Keep stitching! Thank you so much for this! I have been making my own bias, but cutting small pieces from the leftover fabric scraps, and then stitching each together individually. It was becoming a bit tiresome. I’m going to try out your method next time I make some! I love this method and often use any left over fabric from a project to make some ‘spare’ so that I can bind necklines etc. with pretty contrast fabrics whenever I want a bit of a change. Great tutorial thank you! I think making bias tape can be a really nice way to spend the afternoon to be honest. If I don’t feel like stretching my brain but I feel like fiddling around I pull out some nice end pieces of cotton lawn and spend it making up some nice bias tape. Since discovering how much love curved hems – there is nothing like a bias finish to make that curve just right!